Sylhet has a rich and interesting history and so I wanted to provide you with a bit of background on how Sylhet came about and what it means to be Sylheti. Sylhet (also known as the City of Shah Jalal) is situated in the Eastern Region of Bangladesh and is located about 180 miles from the capital city of Dhaka. Sylhet was first ruled by Raja Gour Govinda, a Hindu King known for his wretched behaviour towards Muslims. In approximately 1306, India was ruled by the Khilji dynasty. At that time, Hazrat Shah Jalal went from Delhi to Sylhet with a band of 360 disciples from all over the Arabian Peninsula (including Yemen, Jordan, Syria, the Kingdom of Arabia, and parts of Northern India) having been instructed to do so by the Emperor Jalal Uddin Khilji in order to overthrow Raja Gour Govinda from power. Hazrat Shah Jalal’s disciples included pious men, saints (pir’s), princes from the Arab world, and army officers, amongst others. Together they built a Muslim army and set off for Sylhet to spread the word of Islam, settling down in different locations within small towns and villages. Over time, more and more people joined them and accepted Islam. These pious men brought with them not only the message of Islam, but a distinct culture of their own. Hence, Sylheti’s are culturally different; their colloquial language including their culture is mixed in with other languages, for example, Arabic, Farsi, Hindi, Urdu, and of course, Bengali. Sylheti’s are mainly rice and fish eaters and their choice and method of cooking is distinctly different to non-Sylheti’s. Traditional dishes will include sour dishes such as tengha (or tok) cooked with vegetables such as Amra, Defal, Olives (Belfoi), Dewwaa, Amshi, Mango Choti (Aam Choti), Kul (Boroi), Hatkhora (or Shatkora), Ada Zamir (Ada Lembu), and any other sour lemon-like tasty vegetable. Additionally, it’s worth noting that the 360 disciples mentioned earlier, not only brought with them their distinct cultures but also brought distinct cooking styles of their own. These included many types of meat dishes including chicken, beef and goat cooked Moghlai, Middle-Eastern, and Northern Indian style. Such dishes include Moghlai Porota, Pilau, Korma, Kalia, Roast, Biriyani, Kofta curry, and for desserts, the likes of Zardah, Firni and Kheer. Sylhet is famous for its well known products namely tea (Sylhet being the tea granary of Bangladesh), Oranges, Cane furniture, Textiles, and Incense sticks (agor bathi), all of which are exported out to other countries. 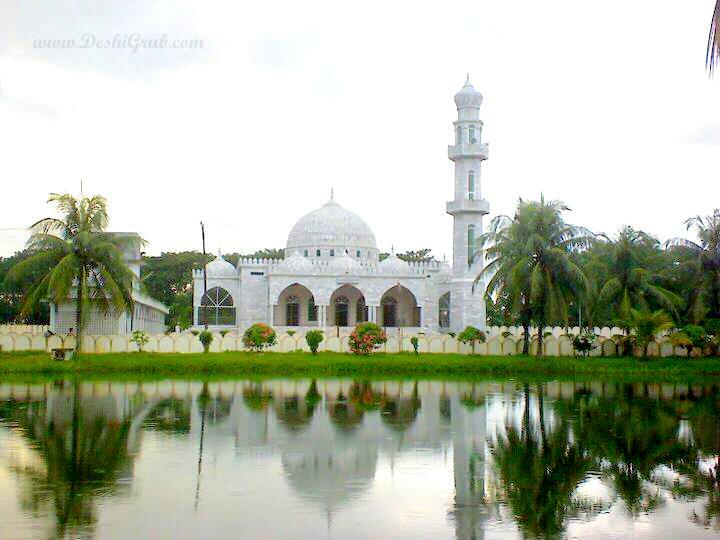 Sylhet is also famous for its rich Islamic heritage with certain mosques dating back to the Khilji’s and Moghul’s. The Shrine of Shah Jalal, Shah Paran (his beloved nephew), Syed Nassir Uddin Sipahsalar and many others, stand as a symbol of Muslim glory and wisdom. Mosques built in recent years are similar to those in Middle Eastern countries and attract people from all over the world to Bangladesh. One such mosque (amongst others built by my family), is the illustrious mosque The Delawar Hossain Chowdhury Jami Mosque (named after my paternal grandfather) built and established by my uncle Mahmud Us-Samad Chowdhury which stands proudly in front of our village home in Noorpur, Fenchuganj – Sylhet. Huge thank you to my Abba (father), Mr Ziaus Samad Chowdhury JP, (Senior Justice of the Peace in the U.K, and former Chief Community Development Officer of Metropolitan Borough of Sandwell, U.K), for his assistance with this overview. Khub shundar. Besh bhalo laglo phoria. We all shyletis are proud to be one of the best in the world. liked it very much .beautiful.visiting sylhet is a much. Oh wow we are from the same place in Bangladesh. Noorpur, fenchugonj. Keep up with your recipes and loving your site! Glad to read read this. I am from the Indian side of the Sylhet. I would like to ad to this article. Gour Govinda was finally killed by the Azaab of Allah and his palatial bulding fell into the river after one of the desciples of Shah Jalal RA offerred Azaan. The wretched Gour Govinda slaughtered a baby boy whose father did Aqeeqa with a cow. This is a miraculous event in the history of Sylhet. The ruins of Gour Govind are a witness to this till today. Kub valo description oiche. Food er part ta beshi better hoice. Thanks for uoploading.